DARBHANGA, India – When a 13-year-old girl in the remote village of Darbhanga, in India’s Bihar State, overheard her parents planning to marry her off to a 15-year-boy the very next day, she had little hope to stop it. Child marriage is a deep-rooted norm in her community. In a 2015-2016 survey, around 40 per cent of women in Bihar, aged 20-24, reported being married while they were younger than 18. Yet this practice is a human rights violation, and it is illegal under Indian law. Child brides are more likely to not be in school, and they are more vulnerable to abuse. Marriage also exposes girls to teenage pregnancy, which is a health risk to themselves and their children. According to the recent survey, 12 per cent of girls between 15 and 19 years old in Bihar were pregnant or already mothers. UNFPA is working with the government to raise awareness of the harms caused by child marriage. 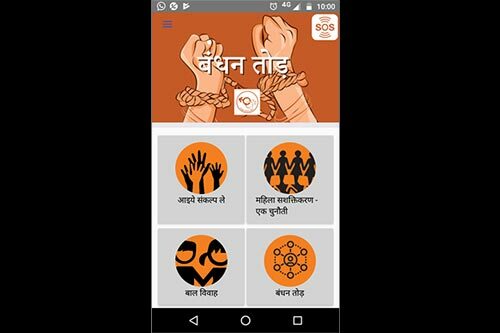 UNFPA also worked with Gender Alliance to create an Android app – called Bandhan Tod, meaning “Break Your Shackles” – that enables girls in Bihar to quickly and confidentially reach out to a network of civil society organizations when in distress. Launched in September, the app has been downloaded more than 3,000 times. In Darbhanga, after the 13-year-old learned of her parents’ plan, she turned to her phone, found the app, and launched an SOS. 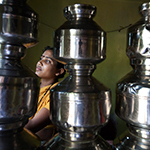 Gender Alliance is a network of 270 civil society organizations. When an SOS is activated, an alert is sent to partners in every district, as well as to Gender Alliance officials in the state capital of Patna. Since the app was launched, around 240 distress messages from across Bihar have been received and responded to. “The average lead time for response to an SOS is less than five minutes,” said Prashanti Tiwary, who leads Gender Alliance. 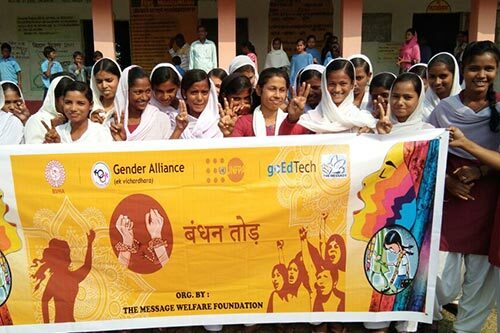 On 24 November, Gender Alliance received three SOS messages in quick succession, all from the girl in Darbhanga. The nearest civil society partner rushed to the girl’s home and spoke to her parents, amid a gathering of village elders. But the parents were unconvinced, insisting the wedding move forward. The next step was to inform the police. “With time racing by, we approached the director general of police at Patna, who immediately swung into action,” said Ms. Tiwary. Anjani Singh, deputy superintendent of police in charge of the area, led a squad of officers to intervene. The wedding proceedings had already begun when the police arrived – they immediately halted the ceremony. “Had it not been for timely information and accurate coordinates, this little girl would have been married,” said Superintendent Singh. Bandhan Tod also aims to give young people and community members the information they need to end child marriage. It contains embedded video lectures on the human rights issues surrounding child marriage, as well as issues surrounding the practice of dowry. The app also offers incentives for use, such as a rebate in electricity bills. “Educational videos on child marriage and dowry that have been included in the app have been watched around 33,000 times,” said Nadeem Noor, who heads UNFPA in Bihar and regularly monitors the app’s use. As for the girl from Darbhanga, civil society workers say she is continuing her studies.